Most applications need to reference data outside their own code to do anything very interesting. Cinder offers two mechanisms for including data files with your app: assets and resources. These two techniques have a lot in common. The primary difference is that resources are "baked" directly into your application, and assets are separate files living alongside your application. Assets can be easily modified separately from your code, and they take a lot less work to setup, especially on Windows. However, distribution and installation can be simpler with resources since there's no way for the data your application depends on to "go missing", and it reduces the chances that a user might modify your data unexpectedly. TinderBox creates a project layout with separate folders for both assets and resources. Since these files are as much a part of your app as its source code, they'll generally be managed by your version control system (say, git or Subversion) just as your C++ code or anything else in your project is. Additionally, if you need to know where an asset lives in the filesystem, you can call getAssetPath(). // prints: "logo.png lives at /Users/andrewbell/SampleProject/assets/logo.png"
It's worth understanding a bit about how assets work under the hood. The first time you attempt to load an asset or get its path, your Cinder application automatically attempts to find its assets directory. It begins by searching in the same folder in which your .app bundle or .exe lives. Next it searches its parent, on up 5 levels. The reason for such a deep search is due to the somewhat remote location where Xcode and Visual C++ can output executables, depending on their configuration. When you are ready to ship your application, make sure you include both your application (.app on OS X or .exe on Windows) and its assets folder. Note that if you are not using any assets, Cinder does not require the existence of an assets folder. iOS applications of course cannot require a separate folder at runtime. However TinderBox-generated iOS applications automatically include their assets folder in their application's bundle, and the asset-discovery mechanism in Cinder on iOS knows to look here. While Cinder will automatically look for a specific folder as the "official" assets directory, users can use addAssetDirectory() in order to offer supplemental paths for searching for assets. loadAsset() and getAssetPath() will search the primary assets folder first, followed by any supplemental asset directories the user may have provided. That's all there is to know about assets. If you're a beginner with Cinder, this is probably the easiest technique for including data with your application. However it's worth being aware of how to use resources as well. While they're a bit more cumbersome to use, resources allow you to create applications which are entirely self-contained. 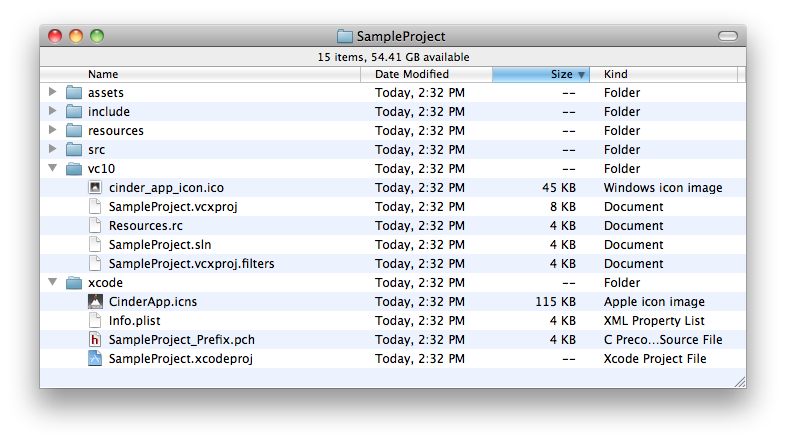 Looking around inside of the application bundle, we see a Resources folder inside of Contents. In here we can find all the data files the application depends on. 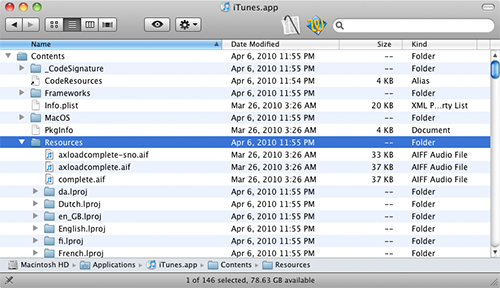 As an example, the first few visible files in the screenshot are audio files iTunes plays as part of its user interface. A similar structure is maintained for iPhone and iPad apps, and it's the one Cinder uses for these platforms as well. Now select the file you'd like to add to your app from the Open dialog box that follows. 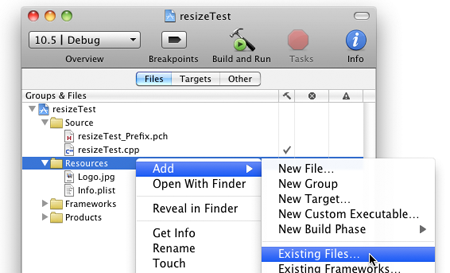 After choosing your file, you'll see it listed in the Resources group of your Xcode project. 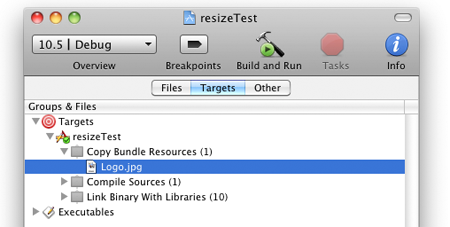 The real magic happens though when Xcode copies these files into your application bundle at build time. To confirm that this will happen, select the Targets tab of your project inspector and reveal your application target under the Targets section. You'll see a build phase called Copy Bundle Resources and inside that will be the resource you've just added. Let's take a look now at how resources are handled on Microsoft Windows. The most noticeable difference relative to OS X is that resources are not stored as individual files, since an EXE does not encapsulate a directory like an OS X application bundle does. Instead, resources are baked into the EXE using a resource compiler, and are stored as binary data. However we can access this binary data in memory using the same loadResource() routine we do on OS X. Furthermore, Cinder's internal code is able to handle loading from either the flat file or in-memory representations transparently and efficiently, so in general you will not need to change application code between the platforms. Note: The text which follows is helpful for understanding how Windows resources work under the hood, but we recommend you read and consider the alternative techniques under the Cross-Platform Resources section as well, even if you are writing Windows-only code.